Follow all the latest news on Apple right here! Apple announced it’s fiscal Q4 earnings, posting a record revenue of $75.9 Billion and a record EPS of $3.28, beating Wall St.’s consensus estimates of $76.7 Billion and $3.23 respectively. 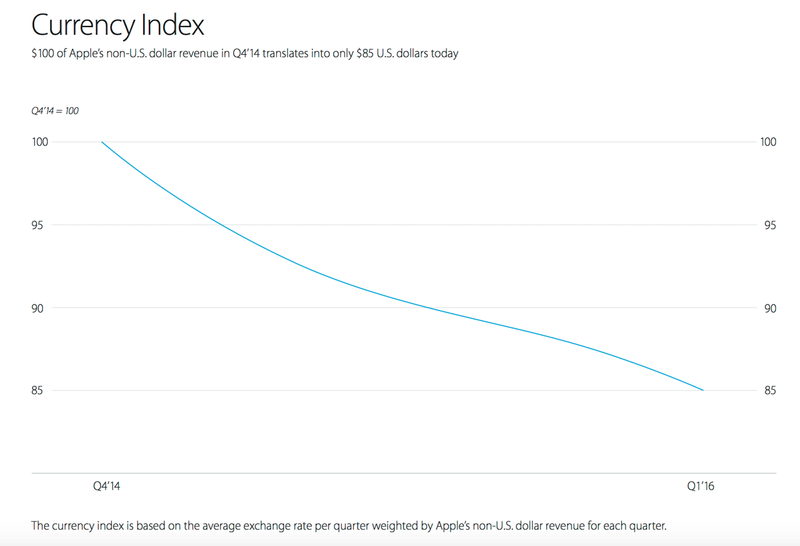 More importantly, Apple also announced it’s guidance for fiscal Q1 earnings, coming in at $50-$53 Billion, down largely due to exchange rate headwinds (source). With Q4 revenue and EPS growth, and Q1 revenue guidance better than expected, what did the market get wrong? 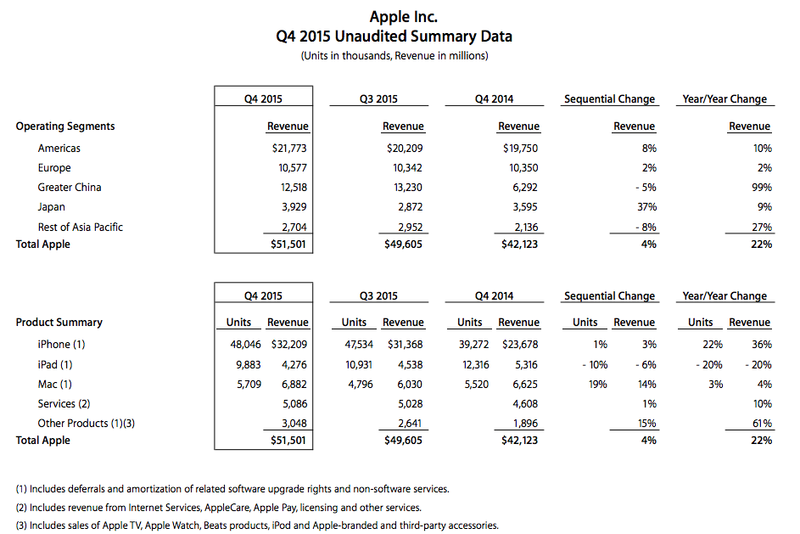 To answer that question, let's take a look back at the last 6 months of the stock AAPL versus the company Apple. Apple investors have been on a rocky ride since July of last year after the stock tumbled over 30% from it's 52-week highs of over $134 a share to as low as $92 a share within a single month, triggering a dreaded “death-cross” signal in the stock before recovering to it’s current price of $100 per share. What had began as a distant fear of a “hard landing” in China and a strengthening US dollar hurting Apple's earning, the selloff had quickly escalated into a full blown panic. Analysts began downgrading the stock, citing growing risks in China (source). Despite posting 112% year-over-year growth in China, currency headwinds continued, and the stage was set for the stock’s biggest declines since 2012. By late August, fears from China head spread across global equity markets, causing wide-spread selloffs, pushing Apple’s stock deeper into the red. The renewed declines even prompted Apple’s CEO Tim Cook to break the companies ordinarily steely silence to reassure investors that Apple’s business in China was booming (source). But the echo chamber of pessimism had grown too loud, and the relief was merely temporary. 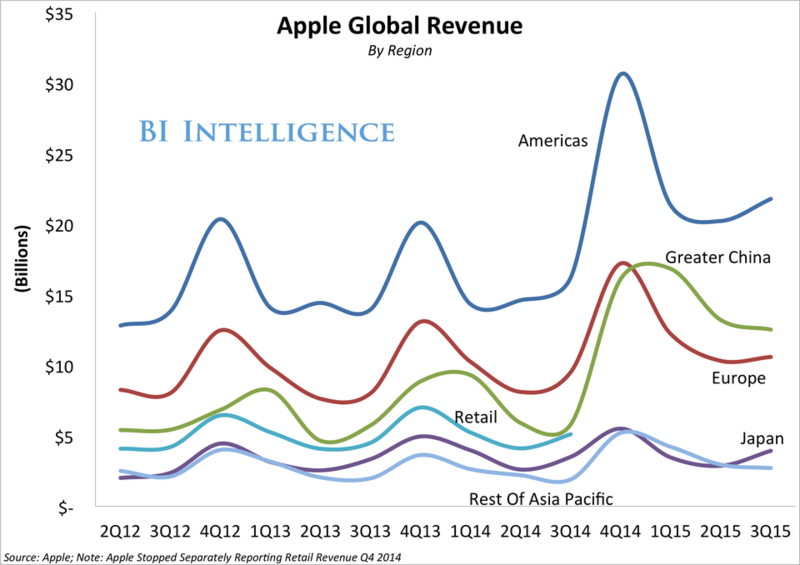 Global market’s remained volatile, and Apple’s stock continued to languish well below it’s 2015 highs. On September 9th, Apple held it’s by now sacred annual “Special Event” with the eyes of the world watching in anticipation of Apple’s all new iPhones and long rumoured Apple TV. At the event Apple showed off it’s all new processors, cameras, colours, 3D touch, Apple TV with an all new UI and App Store and so much more. Initial reception was predictably tepid, but overall positive, with the usual comments on Apple’s efforts merely incremental, and far from revolutionary (source). However, by September 25th, it was clear that customer anticipation had reached fever-pitch. The iPhone 6s & 6s+ launched to record demand, selling 13 million devices in it’s first 3 days of sale, up 30% year-over-year (source). Despite the better than expected data from the company (source), and announcing a massive earnings beat in October (source), the market’s pessimism on the stock was set. By late October, the markets focus was squarely on iPhone 6s & 6s+ global demand, and all too familiar rumours of supply chain cuts began trickling in one after the other (source). It wasn’t long before the negative headlines and analyst downgrades resumed (source). With Apple's fiscal Q4 guidance by then well established, and Tim Cook reassuring investors that iPhone sales in the holiday quarter would set an all time record (source), the market could only read the influx of negative iPhone headlines as a bad omen for fiscal Q1 2016 (source). Ignoring past inaccuracies of such rumours, the sentiment for 2016 quickly worsened, with analyst predicting iPhone unit sales declines and overall revenue decline as drastic as 10% year-over-year (source). However, as tracked by my widely followed pre-order inventory tracker, Apple had clearly entered the holiday rush with a much more robust inventory and supply chain ramp up than it did in the year ago quarter. But was this more than a simple inventory readjustment and not an indication of weaker demand in 2016? Meanwhile, another rumour began to emerge from Apple's far-east supply chain - this time about a possible off-cycle 4-inch iPhone release dubbed the iPhone 5se. However, what was particularly interesting about this rumour, and what was widely ignored by investors and analyst alike, was the likely effect it would have on Apple's highly complex global channel inventory. With a new iPhone launching, Apple would need to prepare by drastically reducing the channel inventory of older models to make way for a newer model expected to launch exactly when market watchers were calling for sales declines to peak - highlighting an all too familiar cautionary from Apple not to take supply chain rumours simply at face value. Apple has begun accepting pre-orders for the iPhone 6s and 6s Plus in first wave launch countries including: Australia, Canada, China, France, Germany, Hong Kong, Japan, New Zealand, Puerto Rico, Singapore, the UK, and the United States.